When it comes to the junior exploration sector, not much over the past 2 years has peaked investor interest. One large (and high-grade) caveat to this is the Patterson Lake South (PLS) uranium discovery made by Alpha Minerals and Fission Uranium in the fall of 2012. With a ten metre step-out drill hole late in a fall program Garrett and his father Ben Ainsworth joined mineral exploration legend as one of the only father and son teams to make a discovery. 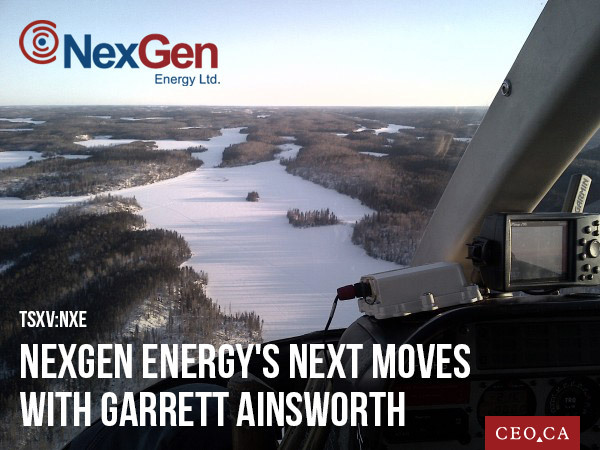 We had a chance to sit down with NexGen Energy’s (NXE:TSXV) President and CEO, Leigh Curyer and his newest hire, Garrett Ainsworth. NexGen is coming off a company transforming 10-day period. Firstly, the company announced their initial assay results from the Arrow target which confirmed the discovery of a new high-grade uranium deposit near PLS on the Rook I project (29m of 1.04% U308 in hole 27, and 124.1m of 0.68% U308 in hole 30). Secondly, they announced that the co-discoverer of the PLS uranium deposit, Garrett Ainsworth, would be joining their team to head up their exploration efforts as Vice President of Exploration and Development. In 2013 Mr. Ainsworth was the AME BC recipient of the Colin Spence Award (For Excellence in Global Mineral Exploration) in recognition of his efforts which led to the discovery of the R00E, R390E, and R780E mineralized zones at PLS. NexGen’s technical team already includes: Andrew Browne (now technical advisor), a globally recognized expert in uranium exploration, as well as two prior Hathor/Rio Tinto project geologists, James Sykes and Matthew Schwab. Mr. Ainsworth was quick to credit NexGen’s technical team for their execution to date and for making a discovery in such a relatively short period of time. 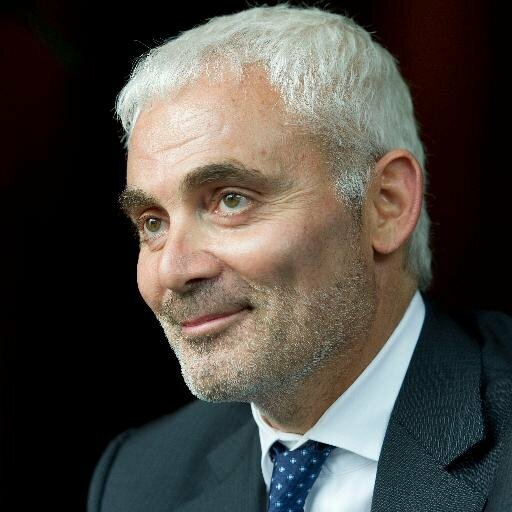 Among Ainswoth’s duties will be to join Mr. Curyer on the road to tell NexGen’s story to investors abroad. Considering Ainsworth’s track record of wealth creation, combined with his enthusiasm for the project, this could be seen as a good thing for NexGen’s share price. When I spoke to Mr. Ainsworth about what he sees in NexGen he told me it brings him back to the early-days with his father at Alpha Minerals and the PLS discovery. Recall, Alpha agreed to be acquired by 50-50 JV partner, Fission Uranium, in September 2013 for stock, valuing the company at over $200 million (12 months prior, investors could buy the shares at a valuation of less than $5 million). With his abundant enthusiasm for the Arrow Discovery and its apparent similarities to PLS, I wanted to know if Garrett saw any differences (good or bad) between the two. Speaking to the fact that the investment community has appeared to miss the significance of the Arrow Discovery, Garrett was clear to remind me that, although the mineralized zones at Arrow are deeper than PLS, they are by no stretch “deep”. “There is actually a very significant intersection of mineralization in hole 27 that starts at 235m and consists of 29m of 1% U308. I’m trying to hammer that home because 235m is not deep. It just isn’t,” Mr. Ainsworth stated. Mr. Curyer also reminded me that Arrow was actually ranked number 9 out of 12 targets they had identified using geophysics and that the reason they drilled it was simply logistics (partially because it was on land). “There are eight other geophysical targets that we get to drill. We have drilled three to date and all three have mineralization. So we are three for three in terms of targets drilled and uranium hit,” said Mr. Curyer. And as for what’s planned this summer? The company began drilling a substantial 13,500m program which includes three drill rigs; two spinning at Arrow and one drilling to the southeast testing another geophysical anomaly. The spend for the summer program is estimated at $7 million. Mr. Ainsworth, who is now in charge of running the exploration program for NexGen, will have his pick of the 12 geophysical targets. 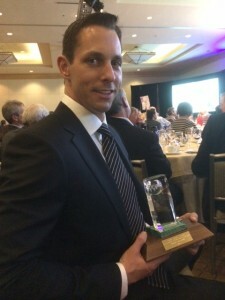 When he was working in the southwest part of the basin from 2007 until he and his father discovered the high-grade uranium boulders in 2012 (which led to the PLS deposit), one of Mr. Ainsworth’s favorite corridors was located on the Derksen trend which runs parallel to the Patterson Lake corridor. “They haven’t explored it (the Derksen trend) in too great of density on the NexGen ground yet, so to me that represents a very intriguing target,” Mr. Ainsworth said. Clearly, the company offers the young Ainsworth the ability to go back in time to the early-days of the PLS discovery with Alpha Minerals. 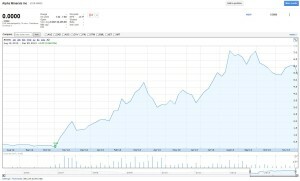 Alpha’s discovery of the PLS deposit in early November 2012 drove their share price from $0.20 to over $7.00 per share in just 12 months (and remember, that was only for 50% of the project). The final drill hole of the Alpha-Fission JV in early 2012 program intersected radioactivity and strong alteration, but didn’t garner much investor appreciation. It wasn’t until the Ainsworth’s (as part of the Alpha-Fission JV) went back in the fall of 2012 and were able to track back to the source of the uranium boulders that the market paid much attention. With the assays from hole 22, which turned out to be the discovery hole, hitting 8.5m of 1.07% U308 from 70.5m to 79m deep, Alpha shares began to run. 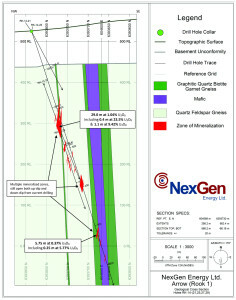 NexGen’s first assay result, hole 27 hit 29m of 1.04% U308 including 0.40m of 23.5% U308 and 1.1m of 9.42% U308. 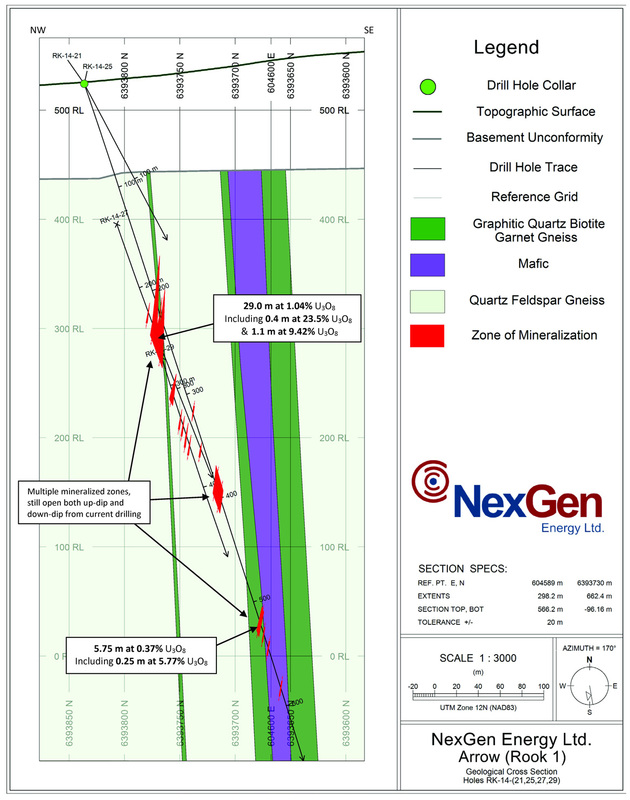 Hole 30 intersected 124m of total composite mineralization at an average grade of 0.68%. Remember that 1% U308 is equivalent to over 20g/t gold or 16% copper (based on $1,335/oz gold and $2.95/lb copper). Clearly, given the similarities between these two holes, established resource investors (like Sheldon Inwentash) continue to accumulate positions, waiting for the rest of the market to give the Arrow Discovery the credit it deserves. Through direct and indirect ownership, Mr. Inwentash controls over 31 million NexGen shares. NexGen has $15 million in cash and a market capitalization of $55 million. Fission, who merged their 50% interest in the PLS discovery with the Ainsworth’s Alpha Minerals, has a market capitalization of over $440 million and just over $16 million in cash. As for what’s next? Mr. Ainsworth will be delving into the existing exploration data at NexGen to optimize Arrow and the other prospects as well as making trips to resource money pit stops like Toronto, New York and London. Resource investors (and most investors, in fact) like to compare investments against each other in order to determine relative value. Many uranium investors like to compare NexGen to Fission. However, there is one critical error in doing so; the stage of development. Fission is hitting consistent and high-grade uranium intercepts after making their initial discovery 24 months ago. They trade at a premium for that (remember, Fission doesn’t even have a resource estimate out yet). On the other hand, NexGen has made an initial discovery and investors get to buy their shares for a 1/10th of the price of a Fission share. Earlier discoveries are always more risky than established plays, however, the rewards are often materially larger as well. It’s now up to Leigh, Garrett and the rest of the team to prove to the market that this discovery is real by continuing to confirm their suspicions with assays. 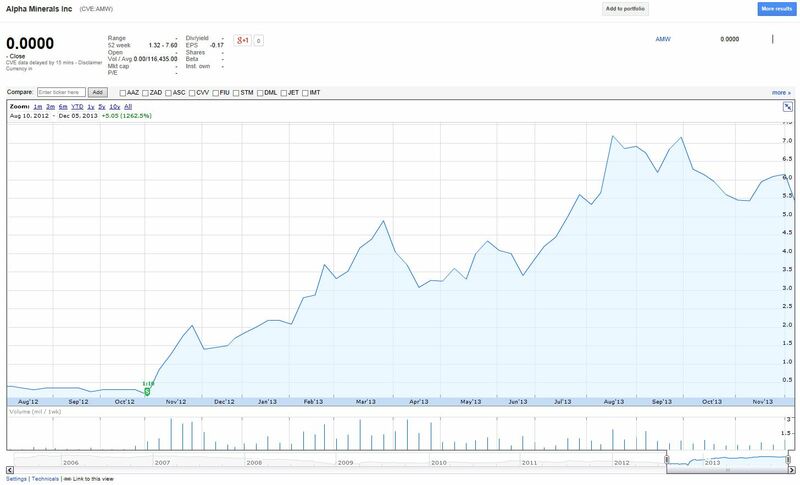 If they are successful at doing that, then there’s no reason why you wouldn’t see a similar pattern to what we saw with Alpha emerge with NexGen’s stock chart. Here’s a video of the Ainsworth’s talking about the PLS discovery. This article is for information purposes only. I own shares of NexGen Energy Ltd. and they are a sponsor of our web site. Please read our full disclosure.